Welcome Home Stagers to the September edition of the Staging Diva Dispatch! How is it possible that 14 years ago I waved my little one into her first day of kindergarten and this weekend I said goodbye in the driveway of her first rental house in a different city then I live in? It was really hard to drive away, but at the same time I know she’s off on a grand adventure and my job was (and still is) to prepare her for it. To be honest, I feel a similar responsibility to the thousands of creative women and men who read my articles and study the business of home staging with me. My goal is to give you all the encouragement, information and tools you need to be wildly successful as home stagers. There is nothing like earning a living doing what you love and I want you to experience how awesome it is to do “work that doesn’t feel like work” because you’re using your natural talents and gifts. I’ve been blessed with the opportunity to support myself decorating my clients’ homes to sell while raising my daughter on my own. And I’m proud of the 7,000 home stagers in 22 countries who are following my formula to build their own home staging businesses too. In this month’s home staging articles you’ll find out why Alfredia locked herself in a tool shed, learn about a casting call for 2 HGTVshows, meet 4 home stagers, see a staging of a pie-shaped condo, and watch a great video about perfectionism. Plus, get my invitation to 2 live events. This is the start of a key real estate season so now is the time to get the information and tools you need to take full advantage of it. You did take me up on the home staging portfolio challenge I mentioned last month, right? 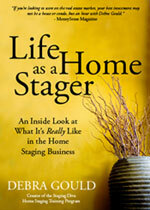 To read this month’s Staging Diva Dispatch articles please CLICK HERE. Here’s to your continued success and Happy New Year to all our Jewish readers!